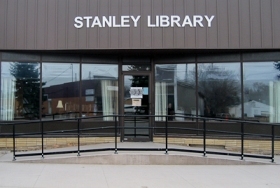 Stanley Public Library | The mission of the Stanley Public Library is to maintain and improve the quality of life of the community by promoting the joy of reading and sharing the resources that enhance knowledge. The Stanley Public Library will be closed Friday, April 19 in observance of Good Friday. The library will be open Monday, April 22 at 12:30 PM. Happy Easter! On Friday, April 5, the 4th grade classes of Mr. Hellman, Mrs. Johnson and Mr. LaBar visited the Stanley Public Library as part of National Library Week. The students were given a tour of the library, had the opportunity to purchase used books and movies and registered for prizes. The students were invited to visit the library during National Library Week for games, activities and library souvenirs. During the month of March, the Stanley Public Library held a Reading for Rewards contest for students in grades K-6. The students checked out books, read and returned them for an entry into the contest. The winner for March was Braylen Flageolle, who read a book titled “Deadpool.” Braylen won a $25 VISA gift card sponsored by Braddock Insurance. Congratulations to Braylen and to all the students who read a book to enter the contest!